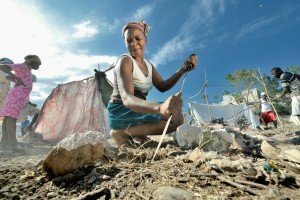 In the wake of the devastating January 2010 earthquake, the United States government pledged a total of U.S. $4 billion to Haiti for humanitarian relief assistance, reconstruction and development aid. Since its allocation, much of this aid has failed to reach the populations that need it the most. According to the Government Accountability Office, nearly 50% of allocated foreign aid remains unspent, and of the funds deployed, less than 1% of aid went directly to the Haitian government. Meanwhile, the U.S. government prioritized foreign contractors (60% of which were Washington DC-area firms) while less than 1.5% of contracts went to Haitian companies. Since 2010, the HAWG has advocated for rigorous accountability and transparency in U.S. foreign aid to Haiti, as well as participatory mechanisms that measure the effectiveness of aid among vulnerable populations. Following three years of Hill-focused advocacy in summer 2014, our coalition facilitated a major victory when the United States Congress passed the Assessing Progress in Haiti Act (APHA), a bill that increases oversight of USAID’s operations in Haiti. Since the passage of this legislation, the HAWG has worked with Congress and the Administration to ensure that APHA is thoroughly implemented. The HAWG believes that consultation and coordination with domestic Haitian organizations and the Government of Haiti is critical to successful development, and advocates for systematic documentation of aid disbursement to ensure aid accountability and efficacy.